A disease-inducing fungus in amphibians worldwide could become deadlier as different genetic variations emerge, according to research led by The University of Alabama. Biologists tested the harmfulness of a Brazilian hybrid form of Batrachochytrium dendrobatidis, known simply as Bd or the amphibian chytrid fungus, as well as both parent forms, on species of frogs from the Brazilian Atlantic Forest. They found infections and strength of the illness increased with the hybrid form. Published today in Scientific Reports, the research is the first to demonstrate hybrids of the fungus can be deadlier than more common and widespread fungal genotypes. "With globalization facilitating pathogen spread across continents, hybridization of chytrids might lead to new epidemic waves reducing amphibian biodiversity in both tropical and temperate regions," said Dr. Gui Becker, UA assistant professor of biological sciences. Becker was a co-author on the paper, "Hybrids of amphibian chytrid show high virulence in native hosts," which was led by Dr. Sasha Greenspan, a UA post-doctoral researcher. When the paper was written a few months ago, the Brazilian hybrid of the fungus was the only one documented, but new evidence shows another hybrid of the fungus emerged in South Africa, Greenspan said. "The genetics of this fungus are changing, and with these changes may come new risks for frog populations," she said. Infectious outbreaks of the disease caused by the fungus, chytridiomycosis, have afflicted amphibians for at least 40 years on every continent except Antarctica, sometimes killing massive numbers of animals and, occasionally, extinguishing some species. The fungus' complex genetic history is not completely understood, but a relatively new version, on an evolutionary timescale, is known as the Global Pandemic Lineage, or Bd-GPL. What led to its emergence is unknown, but it is particularly deadly. In Brazil, Bd-GPL reproduced with another lineage, a process known as hybridization, and the UA-led research shows the hybrid fungus can be even more deadly than Bd-GPL in native frogs, Greenspan said. "This is significant because it shows that hybrids of this fungus can increase disease risk," she said. 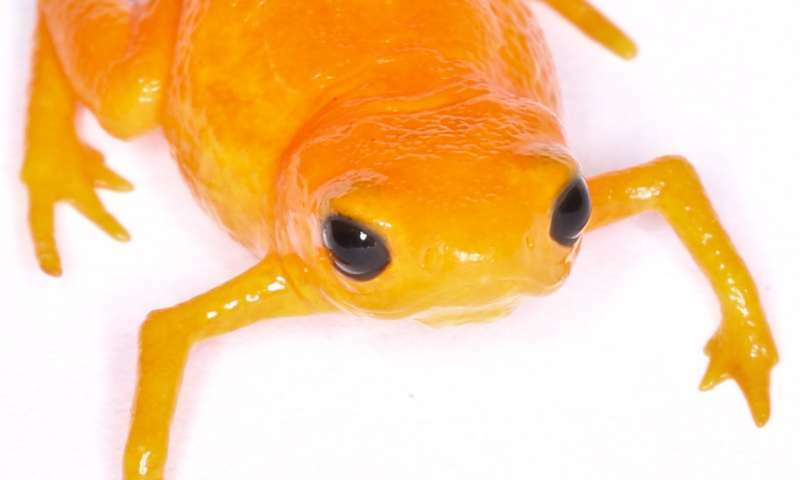 The team conducted the research at the University of Campinas in the state of São Paulo, Brazil, and included a diverse array of frogs native to the Brazilian Atlantic Forest, including Brachycephalus ephippium, called a pumpkin toadlet among other names; Ischnocnema parva; and Dendropsophus minutus, a lesser tree frog. "Since it is well-established that Bd has a dynamic genome and is now nearly globally distributed, this finding highlights the importance of global surveillance to detect future genomic shifts in this disease system that could lead to new outbreaks of chytridiomycosis," Greenspan writes in the paper.